Mention the southern Californian City of Riverside and people often think of oranges. This is hardly surprising, since it’s the birthplace of the state’s citrus industry and home to an internationally respected citrus research center run by the University of California, Riverside. An effort is now underway, though, that could change perceptions about food production in this citrus hub. UC Riverside and city government are collaborating on a new initiative to get farmers and residents to think outside the area’s traditional export-oriented citrus growing model by promoting development of Riverside’s local food system. 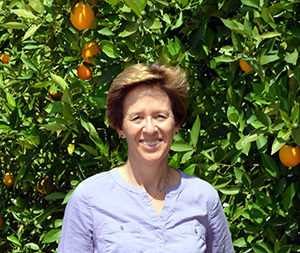 Seedstock spoke to Dr. Peggy Mauk, Director of Agricultural Operations at UC Riverside, to learn more about this work. Seedstock: What is UC Riverside doing to help build the local food system? Mauk: We have several things going. We have a student garden. The students were active in requesting that a field be given to them. I thought it would be great to have a student farm that’s associated with the research station. We have about a three-acre block, of which right now they’re managing about an acre. There are several rows of citrus and they’re growing row crops, farm crops, and vegetable crops. Their goal is to provide food for the dining services, but also they’ve put on educational outreach events for local students and incoming students. And they have several student projects going on there where they’re going to farm and create different sustainable growing systems. Their intent is to be growing (organically). They’ve done a wonderful job working with the other community gardens and the City of Riverside and developing “healthy-food, healthy-living” type projects for the garden. Another thing UCR is doing is we’re part of the new UC food initiative. The overarching goal is for UC system-wide to become a recognized global leader in the areas of food availability, security, sustainability and health and nutrition. One of the aspects of the UC food initiative was buy local (as well as) have classes available and have a catalog for students to learn what classes are available for local food systems system-wide (across UC’s 10 campuses). For us as a campus, the document is still evolving. Seedstock: Tell us about the collaboration between UCR and the City of Riverside. Mauk: It started with the city. I got pulled in late in the planning process. One council member is passionate—he wants to find a use for the greenbelt area, because there are residents that have five-acre blocks that are just vacant, and they have inexpensive water and certainly opportunity to grow locally. That would help the city. Mauk: Buying local has economic benefits to the local economy; it supports the local farms, suppliers, markets, restaurants, etc. It also can increases food access in food deserts. UC policy specifies that we buy a portion of produce locally, but not necessarily from the adjacent community. Much of what we purchase has ties to our local economy. System-wide, UC would like to increase buying locally, but more importantly, educate youth about the importance of food systems, food access, health, nutrition, agricultural production, etc. UCR’s vision is broader than buying locally and includes research to improve agricultural production from breeding to pest and disease control. We have a vested interest in developing programs to increase outreach to youth and the community. Seedstock: How are you trying to promote local production and distribution? Mauk: We’ve been looking at networks for new growers and trying to connect them with classes, and that’s one aspect that I’m going to be working on, and also to help them figure out networks to direct market to restaurants, as well as schools and farmers’ markets. Growing is all good and well, but you have to be able to sell it. Otherwise you’re not going to be able to be sustainable economically. We’re trying to pull all those pieces together, so that it will sustain itself. Seedstock: What’s the most important thing people should know about UCR’s work on this topic? Mauk: To me the most important is the outreach component. The connections that we’re making with the student garden, to me, is going to be what the community sees the most. The other aspect is the work we do in terms of research, especially on citrus, because that’s the largest percentage of our acreage. Interest will be on citrus, in the long term, on finding a sustainable control that’s not pesticide-based for controlling pests. In terms of general food systems, I think that it’s a movement that’s evolving very quickly, and we’re a part of it. We’re just working those programs out, especially in connection with the garden and the community of Riverside.